CDP-choline stands for cytidine-5-diphosphocholine. This unique form of choline readily passes through the blood-brain barrier (BBB) directly into the brain tissue. 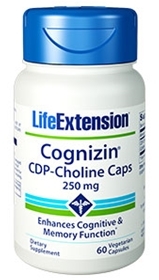 Once past the BBB, CDP-choline activates the synthesis of critical components in cell membranes, enhances cerebral energy metabolism, and increases levels of various neuro transmitters. Other ingredients: rice flour, magnesium stearate, silica, gelatin, water. Contains rice. This product contains NO milk, egg, fish, peanuts, crustacean shellfish (lobster, crab, shrimp), soybeans, tree nuts, wheat, yeast, gluten, or corn. Contains NO sugar, and no artificial sweeteners, flavors, colors, or preservatives.